Preliminary results of the Hydrogel Endovascular Aneurysm Treatment (HEAT) trial were announced at SNIS this year and suggest decrease recurrence rate with hydrogel coils. Johnson and Johnson's Codman Neuro undergoing rebranding under Cerenovus while acquiring Pulsar Vascular (PulseRider®) and Neuravi (EmboTrap®). 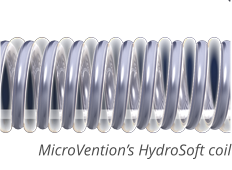 Christian Taschner, MD, PhD and others at University Hospital Freiburg in Germany reported decreased adverse outcomes with second generation hydrogel coils (Microvention Hydrosoft or Hydroframe) compared with standard platinum coils. Help support the Brain Aneurysm Foundation (www.bafound.org) with their new campaign focused on education and research for the 1 in 50 people who have a brain aneurysm.